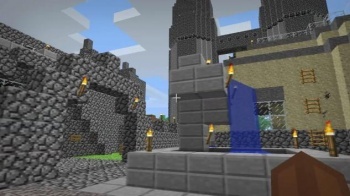 Mojang and the United Nations think Minecraft players could successfully redesign urban centers. As anyone who has played Minecraft is already aware, it isn't just a game, it's also an excellent design tool. Mojang's flagship title is capable of rendering the imaginations of players in real-time without providing tutorials in architecture, engineering, or even programming. Very soon, this creative principle will apply to more than mountain fortresses and meticulously crafted continents. Not content to simply facilitate the construction of digital worlds, Mojang is teaming up with UN Habitat for an initiative that allows local youth to redesign urban areas in desperate need of restructuring. "Today we're extremely excited to announce a new collaboration with UN Habitat called 'Block by Block'," reads an update on the Mojang blog. "Just like [Mina Kvarter], 'Block by Block' aims to involve youth in the planning process in urban areas by giving them the opportunity to show planners and decision makers how they would like to see their cities in the future ... The three-year partnership will support UN-Habitat's Sustainable Urban Development Network to upgrade 300 public spaces by 2016." Block by Block's initial pilot project will focus on a playground in Nairobi, Kenya, which Minecraft builder group FyreUK has reconstructed within the game world. Once the pilot goes live, the server will open up to Kiberan locals who can redesign the landscape in a way that meets their own needs, before the finished project is sent to city planners for consideration. Mojang actually ran a smaller version of this project called Mina Kvarter (or "My Blocks") that gave Swediesh communities an input on upgrades to their 50-year old neighborhoods. The success of the program is what drew the attention of the United Nations, who approached Mojang about implementing a similar idea on a much larger scale. Upgrading 300 public spaces may seem a daunting task, but remember that Minecraft has enabled players to design entire cities in a period of weeks. Upgrading parks and public locations over the course of three years should be as easy as finding the ingredients for a Minecraft cake.